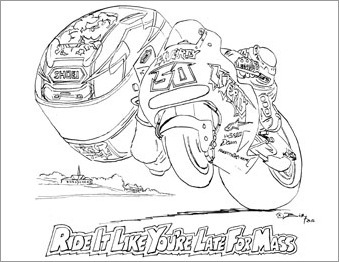 Eugene Laverty 'Ride It Like You're Late For Mass' 2015 MotoGP limited edition giclée fine art print by Billy. This is a brand new limited edition fine art print of Eugene riding the Aspar Honda MotoGP race bike. Eugene commissioned this piece of art and will be using it on his personal merchandise. This limited edition of only 20 copies and 5 artist proofs of Eugene is a giclée print on archival matte art paper using Ultrachrome K3 inks and each print is signed by Billy. The giclée fine art prints of Eugene on the Honda MotoGP race bike are taken from Billy the artist's pen, ink and watercolour painting. The giclée print is available in A4, A3 and A2 and is embossed and signed by Billy. Each print comes with a certificate of authenticity. 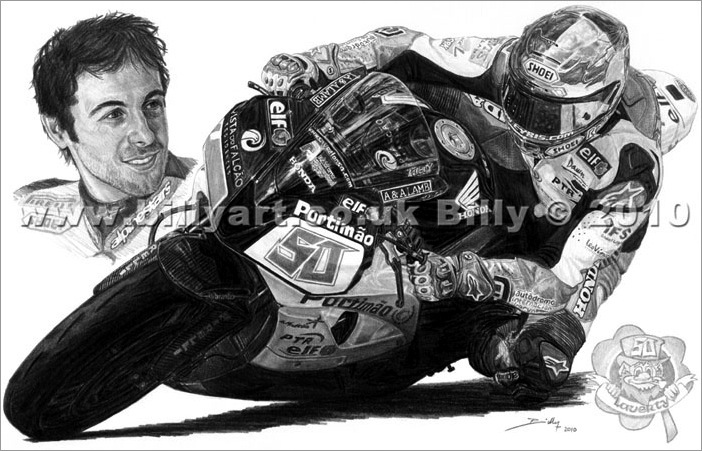 Each print will come with a free A4 pencil print of Eugene from his 2010 World Supersport ride. Watch the Eugene Laverty cartoon Timelapse. FREE A4 Eugene Laverty Cartton Colouring Sheet. This print has free UK post but I use 'Airsure' or 'International Signed For' for international orders so chose UK or international below to purchase the Eugene Laverty fine art print. If an international buyer wishes to purchase more than one print then please contact Billy with your requirements and one invoice with one International shipping fee will be sent to you. Eugene Laverty riding the 2010 CBR 600 RR in the World Supersport Series that he came second in which has led to his signing for the Yamaha Sterilgarda World Superbike Team for 2011. This Limited Edition print of Eugene Laverty riding the 2010 CBR 600 RR is an edition of 70 signed and numbered by Billy. 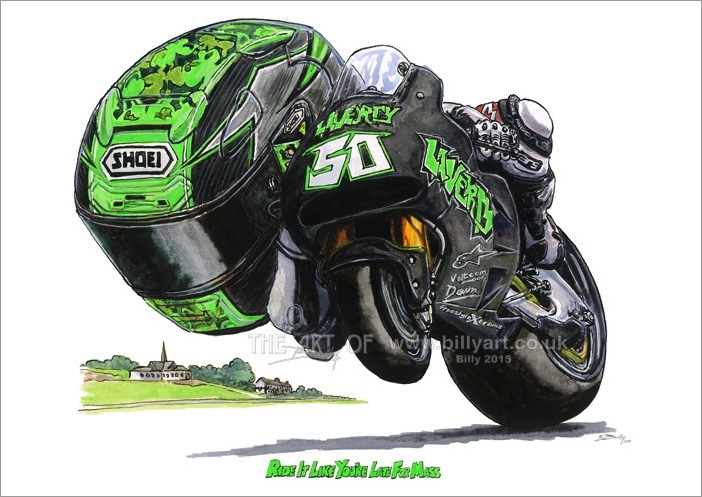 Taken from Billy the artist's A4 pencil drawing the print of Eugene Laverty is A4 in size(297x210mm and will fit in a standard size A4 photo frame) £20 each with free post and packing. Eugene Laverty won the 'Rider of the Year' award at the December 2010 Enkalon Bike Show Awards Ceremony. Eugene Laverty is pictured here with Billy with the Joey Dunlop Trophy and the original drawing of the ride that won Eugene the award. 'Eugene Laverty' by Billy is a unique Eugene Laverty fan collectors print that would make a great gift. AVAILABLE IN A4 AND US LETTER SIZES. 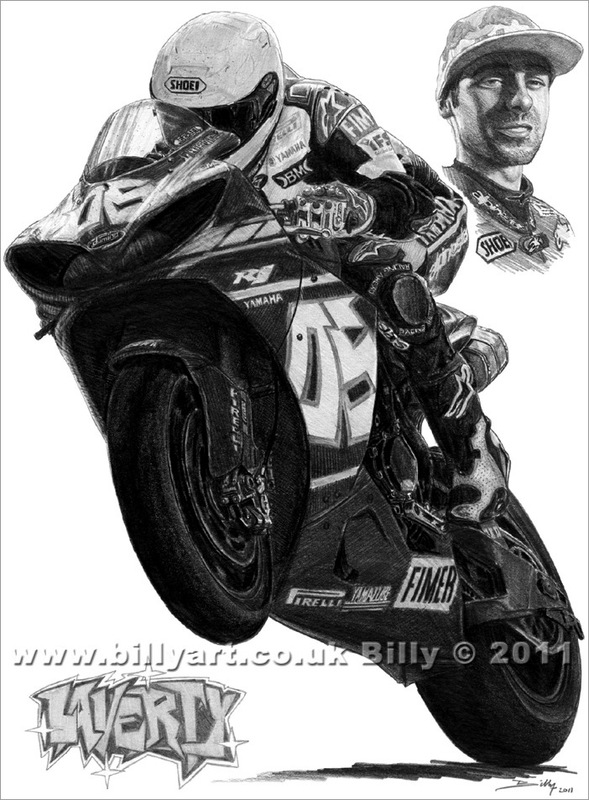 'Billy Art' Water mark does not appear on the downloaded Eugene Laverty YZF - R1 2011 Test print file. This free Eugene Laverty YZF - R1 2011 Test print by Billy is available in two sizes, A4 and US Letter. Click the links below to download the PDF file of your choice. The Eugene Laverty YZF - R1 2011 Test PDF's were outputted at the 'Best' quality and are a 2+ meg file. So when you print them at home you can set your printer to its highest output if you would like to get the best quality results for your free Eugene Laverty YZF - R1 2011 Test print. The original Eugene Laverty YZF - R1 2011 Test pencil drawing by Billy the artist was produced on Winsor and Newton Smooth Surface 220gsm Heavy Weight Cartridge Paper. Hahnemühle produce a variety of high art printer papers and canvases for your inkjet printer to print your free Eugene Laverty YZF - R1 2011 Test fine art print by Billy on. To download your free Eugene Laverty YZF - R1 2011 Test print by Billy alt click (or cntl click) for Mac users. Right click and save target as for PC users. Eugene Laverty YZF - R1 2011 Test by Billy is licensed under a Creative Commons Attribution-Noncommercial-No Derivative Works 3.0 Unported License. Permissions beyond the scope of this license may be available at http://www.billyart.co.uk/. Full Terms and Conditions for the Eugene Laverty YZF - R1 2011 Test Print by Billy are at the bottom of the page. You may download this Eugene Laverty YZF - R1 2011 Test Print by Billy and print it off for your own use and pleasure or to give as a gift to a family member, friend or colleague. This Eugene Laverty YZF - R1 2011 Test print by Billy must not be reproduced for commercial resale purposes in any form. If you are charged for this image then please report the infringement use to your local trading standards office and Billy. The Eugene Laverty YZF - R1 2011 Test image may be used in magazine or web articles if talking about Billy the Artist and his work or if letting others know about the free Eugene Laverty YZF - R1 2011 Test print. 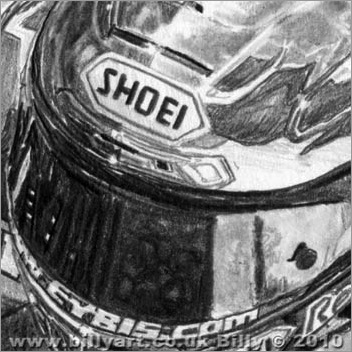 Always credit Billy as the artist of 'Eugene Laverty YZF - R1 2011 Test' pencil sketch with a link to the free Eugene Laverty YZF - R1 2011 Test print page URL at the bottom or a direct link to Billy's website home page if space doesn't allow. DO NOT post the Eugene Laverty YZF - R1 2011 Test print to be downloaded from any other site. ALWAYS put a link to the Eugene Laverty YZF - R1 2011 Test download page on Billy's website. URL link to the Eugene Laverty page below. The Eugene Laverty YZF - R1 2011 Test print by Billy is for personal and non commercial uses only. Contact Billy if you wish to use his Eugene Laverty YZF - R1 2011 Test image commercially for any reason.